I've told this story before, but now seems like a good time to revisit. I met Neil Young with my sister in 1999 at the Fox Theatre in St. Louis, after one of his solo acoustic shows. Since we had been sitting in the orchestra pit that night, we were invited to a Bridge School Benefit after party that we were told Neil would be attending for a few minutes. I remember him showing up about midway through the gathering, in quiet fashion; there was no announcement. I just turned around and he was standing there, fiercely gazing at me with his big, wide-open eyes. I remember shaking his hand, thanking him, and asking for a picture; he replied, and I remember this clearly, "I don't see why not." I remember the flash affecting him in a way he did not like, and his manager, Elliot Roberts, immediately asked that no more pictures be taken. Guess I got lucky. I remember my sister asking for his autograph, and he joked with her in his best feminine voice. "Okayyyy," he said. Yes, Neil Young was being playful with my sister. What a trip. 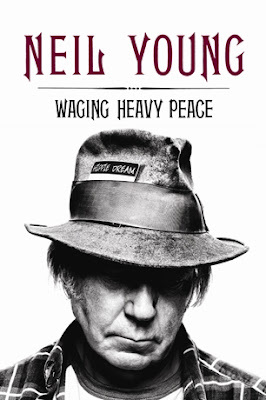 I bring all of this up because Waging Heavy Peace, a scattered memoir with exactly zero form (and all the better for it) -- a book written by Young himself with no ghost writer -- absolutely paints the human side of a rock star who has written some of the best and most important songs of the past forty years. The point of this book isn't for us all congratulate Young on what a great writer of books he is. If you like carefully executed prose, this memoir isn't for you. Waging Heavy Peace reads like much of Young's musical career -- bouncing around from one thought to another, like Young's albums switching from rock to folk to county to electronic to folk and back to rock again. It's a confusing read in a sense that Young writes about what he wants, when he wants to write about it. This is not surprising; in fact, it's quite refreshing to read something by a writer who has no interest in catering to a form he should or should not be following. That's Neil Young. Young begins talking about Lionel Trains, a company of which he still owns a small share. It is quickly apparent to the reader that, besides music and family, trains and cars are two of Young's favorite subjects, and we are reminded of this throughout Waging Heavy Peace. He is a man who feels most at ease when he is moving. 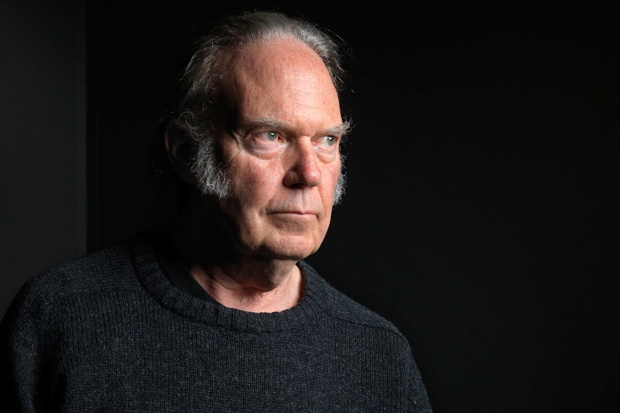 Neil Young does not like to sit still. We're taken through the business dealings of one of his current projects, Pono, an idea that will hope to revolutionize the sound of digital music, presenting the listener with the highest resolution possible (a digital to analog process, with the format still being digital, is the best way I can describe it), something that Young holds dear to his heart. It's the feel of the music that is being lost of today's modern listener, Young believes, and that's why music is slowly dying, he tells us. Of course, without hearing the technology of Pono (which will include the "Revelator" -- a feature that will give the listener an option of switching between MP3 format and Pono format, to feel the difference), it is hard to form an opinion. 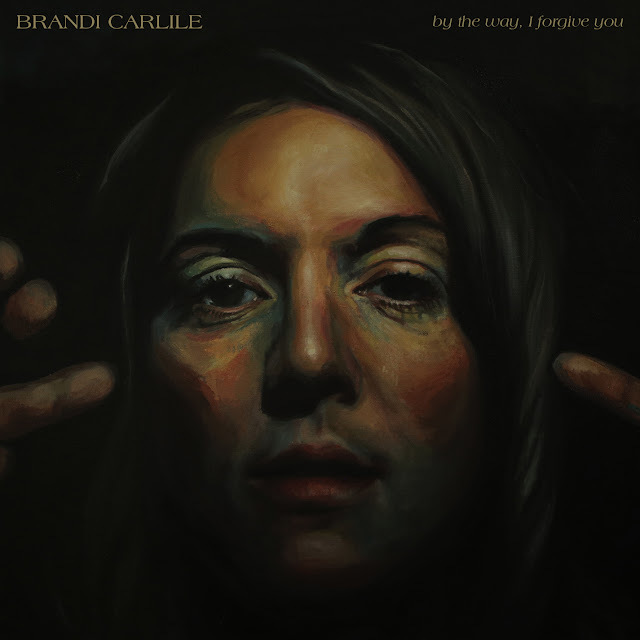 Personally, I love the sound of vinyl, and I only listen to MP3s and/or streaming services like Spotify when it is convenient (which, as Young explains, is part of the problem -- we've become obsessed with convenience). It is very important to note here that Young's dedication to this Pono project appears second to none, and for that reason alone, it shines with promise. Young, as you may know, has not lived an ordinary life. Waging Heavy Peace touches on this -- how Young's properties have caught on fire three times, how original Crazy Horse guitarist Danny Whitten overdosed on heroin the night that Young fired him from his touring band for Harvest (and how Young lit a candle in the middle of the night when he heard the news at something like 3 AM), how Young's second son, Ben (who he refers to almost always as "Ben Young" throughout the book), was born with cerebral palsy, and how his first son, Zeke, also might be living with the same condition, despite the fact that cerebral palsy is not hereditary, and Ben and Zeke have different mothers (note: Young explains that it's possible that Zeke suffered a stroke in utero, which would perhaps eliminate the cerebral palsy diagnosis), how Young's wife, Pegi, survived a a very risky brain operation to remove a tumor, and how Young himself survived a brain aneurysm. "My leg got really hot. I noticed it was wet. My shoe was filling up with blood and my pants were soaked. I called to Eric (Johnson) and turned back toward the hotel. I was weak. He helped me walk. I tried to make it to the hotel, but started fading fast near the front door." "Eric was right there. He had figured it out and was applying massive pressure to my leg where the wound was, holding back the flow of blood...I do credit Eric, absolutely, with saving my life. No question about it." There's more detailing the situation in the book, and it's fascinating reading the minute-by-minute account in Young's words. In short, we're lucky to still have him around. Waging Heavy Peace does have its quirks. Young likes to use a lot of exclamation points, which is odd, and is always casually thanking people, which is not odd, but is a little hokey. But, that's part of the book. We're taken through ordinary trips to Costco, book and music stores, and a situation where his car breaks down on the side of the road, forcing him to call AAA. We are given a small glimpse of his conversations with Bob Dylan and Bruce Springsteen, which, ultimately, leaving you wanting to know more. He mentions John Lennon's negative opinion of his famous lyric, "It's better to burn out than to fade away," and we are given Young's interpretation of the lyric, but he doesn't talk in detail about Lennon, other than Lennon "disagreed with that." We are, however, given a brief aside about Kurt Cobain using the lyric in his suicide letter, with Young stating that "it fucked with me," among other things. But, again, that's probably the point of Waging Heavy Peace: we're always wanting more with Neil Young, and if we're patient, we usually get it.